Paris: The warm smiles and backslapping when Nicolas Sarkozy and David Cameron feted their Libyan victory in September were a distant memory this week as the French leader shoved Britain aside to make way for a new treaty to save the euro. The ease with which Sarkozy left Britain stranded as the rest of Europe opted to steam ahead with new budget rules showed how little the island nation counts for today in Paris, as France and Germany battle to end a devastating debt crisis. But Cameron’s veto of EU treaty change proposals cooked up by Sarkozy and German Chancellor Angela Merkel could mark a new chill as resolving Europe’s debt crisis takes precedence. “A chapter started by Pompidou and Heath might be closing," said Jacques Reland of the Global Policy Institute, referring to President Georges Pompidou’s 1971 lifting of France’s veto on Britain, under Edward Heath, joining Europe’s common market. “France and Britain will still work together in areas like defence but the euro crisis is a much higher priority," he said. Sarkozy’s terse explanation in Brussels of the decision to leave Britain out of plans backed by all 26 other European Union members was at odds with the chumminess he built up with Cameron over their mission to help Libyan rebels oust Muammar Gaddafi. Sarkozy showed genuine friendship in September by lending Cameron a helicopter so he could rush to the bedside of his father, who had suffered a fatal stroke in southern France. But in October he snapped at him during euro crisis talks in Brussels, suggesting he “shut up" and stop interfering. Such was the speed with which Cameron was dumped from the new European master plan that some suspected he had been set up to use his veto so France could nail the speedy inter-governmental deal it really wanted. Set-up or not, it was evidence of how Britain’s influence has waned since it held the EU presidency in 2005, particularly with the eurosceptic conservatives now in a coalition goverment. “Cameron was used," said Reland. “Sarkozy wants to be reelected. He needed a deal. 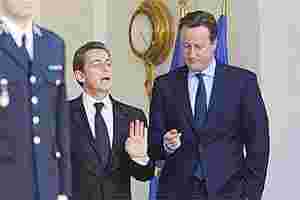 Cameron played his part and I’m sure Sarkozy is grateful. You can’t have feelings in politics." “For France and Germany EU integration is crucial for national interests. Britain does not share this view which is why they’ve parted ways. Sarkozy has removed a spoiler from the European game and there’s a palpable sense of relief." Cameron used his veto after Sarkozy and Merkel refused to exempt London from stiffer financial regulations, worrying that Britain fancied becoming an offshore centre within Europe. Paris and Berlin can now speed ahead with plans to ramp up fiscal discipline, paving the way for the European Central Bank to put a swift end to the debt crisis by buying up more bonds. For Sarkozy, it was a dream outcome, as it could stop France being sucked further into the euro crisis five months from a presidential election and make it harder for opposition Socialists to paint him as economically inept. For Cameron, isolation from the rest of Europe will sideline Britain from crucial decisions that could affect trade and jobs. It could also hit the financial hub he sought to protect if the other 26 EU members back more short-selling bans or oblige euro-denominated transactions to be cleared in the euro zone, as banks could move some operations to Paris or Frankfurt. As British tabloids dissected video footage to see whether Sarkozy had snubbed an attempt by Cameron at a handshake, the British prime minister insisted relations were unscathed. “There was obviously fundamental disagreement ... but it was done in a very good-natured way," Cameron said after the all-night talks in Brussels. “You’ve got to form alliances in Europe for the things you want to get done. I don’t think anything that happened last night will change that." Foreign secretary William Hague also used the term “good-natured" to describe the talks, telling ITV1 televison: “They get on very well. There’s a difference between our countries (but) it doesn’t stop us working together on everything else." “Relations are intact," Sarkozy’s top diplomatic adviser Jean-David Levitte said in Vienna on Saturday, stressing that Britain’s divergence from Europe did not affect its partnership with France in defence and foreign affairs. Even if relations with London have not unravelled, Sarkozy’s focus is squarely on Berlin. His contacts with Merkel are now so frequent that satirical weekly Le Canard Enchaine has first lady Carla Bruni ranting with jealousy in a spoof diary. Sidelining London may not hurt mutually beneficial military or nuclear alliances, but it could deepen what one analyst said was a long-running deficit of understanding of France in the English-speaking world. “The danger is that markets will make judgments on the British view of what is happening when Britain is clearly on the outside," said Nicholas Dungan of the Atlantic Council in Washington, who advises French foreign policy think tank IRIS. “Europe is a family where France is the wife, Germany is the husband and Britain is like the jilted suitor standing outside the house shouting: ‘your marriage will never work!´"
The next indication of where Britain lies on France’s priority list may be the timing of a Franco-British summit, a defence-focused event with heads of state and ministers that was postponed from early December to make way for euro crisis talks. The summit is set to be rescheduled for January or February but could be pushed back until after Sarkozy and Merkel travel to Rome next month as they welcome Italy back into the euro zone core under its new technocrat prime minister, Mario Monti.